Xifengkou is named Lianjing in the book Commentary on the Waterways Classic by Li Diaoyuan of the Northern Wei Dynasty (386-534). It was called Songting Pass during the Song (960-1279), Liao ((907-1125) and Jin (1115-1234) dynasties. According to a legend, a father wandered for many years to find his son, who had been enlisted into the army to garrison the frontier, and finally found him at this pass. Overjoyed after years of separation, both father and son died at the spot, and were buried here. 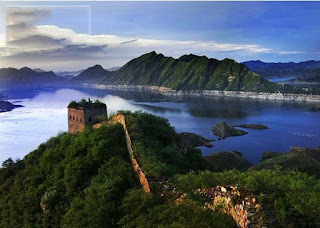 The pass as thus named Xifengkou, meaning “Site of a Happy Reunion”. This name was changed in the Yongle reign period (1403-1424) of the Ming Dynasty to its homophone meaning “Peak of Happiness”, the name it goes by today. Xifnegkou had been an important stronghold since ancient times for its strategic location in the ravine of the Luanhe River. A natural barrier constituted by the precipitous mountains and the deep river, Xifengkou was the site of many contests by opposing armies. Evidence of this can be found in a poem of Lu You, a patriotic poet of the Southern Song Dynasty (1127-1279), which goes “I slapped my pillow shouting ‘Bravo’ in the depth of night/ I woke up and realized that we had recovered Songting Pass with delight.” During the Ming Dynasty, Xifengkou was a major passageway through which the Wuliangha Three Guards if the Mongolians entered the Central Plains to pay tribute to the Ming Dynasty. Later, familiar with the terrain, the Wulianha Three Guards broke through the Great Wall here and invaded the Central Plains. Historical records show that the Ming Dynasty on several occasions dispatched trops through Xifengkou Pass against the Wuliangha Three Guards. Shortly after the Ming Dynasty was established, General Xu Du constructed 32 important passes along the Yanshan Mountains, including Xifengkou. The Ming Dynasty never ceased the renovation and strengthening of the military facilities at Xifengkou. In1452, the 13-meter-high Zhenyuan (Remote-Area-Guarding) Tower was bult on the top of the pass gate and linked with the Great Wall, adding majesty to this important pass. Xifengkou was uniquely fortified. It has three gates connected by a solid brick wall with a stone foundation. At each of the six corners of the gates there was a watchtower. In 1933 the Japanese attacked Xifengkou, in an attempt to break through into the Central Plains. The KMT’s 20th Army resisted their attacks, killing over 1,000 Japanese troops. The song Broadsword March was written to commemorate the heroic exploits of the Broadsword Corps of the 29th Army, and is still sung today. In 1948, part of the Northeast Field Army, led by the Communist Party of China, advanced south through Xifengkou into Northern China, and launched the Beijing-Tianjin Campain against the KMT troops.